A collection of materials related to American women's rights and temperance advocate Amelia Bloomer. Including letters written to Bloomer, documents, photos, and books. Bloomer was one of the pioneers in the women's rights movement and was associated with Susan B. Anthony and Elizabeth Cady Stanton. Most letters in the collection were written while Bloomer lived in Council Bluffs, Iowa, where she helped organize the Iowa Woman's Suffrage Association in 1870 and was named honorary Vice President of the American Woman Suffrage Association in 1890. Council Bluffs Public Library Special Collections. 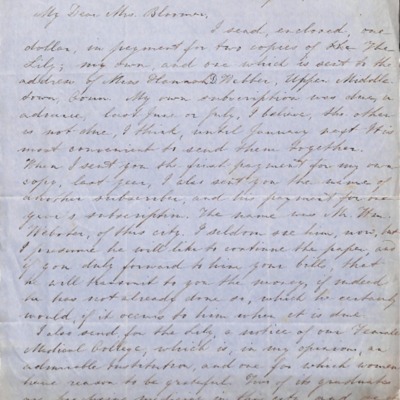 Letter to Amelia Bloomer from Edwin Houghton. A letter written to Amelia Bloomer from Edwin B., Houghton of Boston. Letter asking for an autograph. 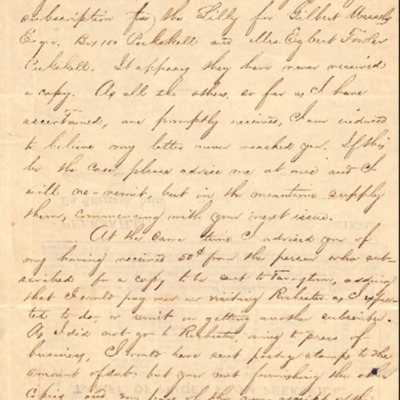 Letter to Amelia Bloomer from Fowler and Wells. A letter written to Amelia Bloomer from Fowler and Wells, New York City. Letter to Amelia Bloomer from Mary G.
A letter written to Amelia Bloomer from Mary G. of Philadelphia, PA. Letter regarding The Lily Newspaper. 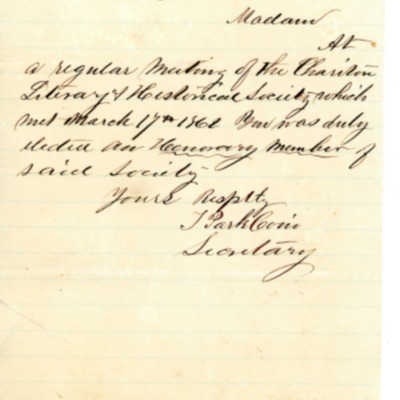 A letter written to Amelia Bloomer from K. W. Kynett of Council Bluffs, IA. The letter is an invitation to give a lecture. 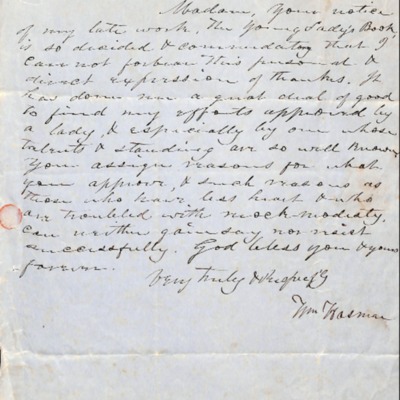 Letter to Amelia Bloomer from William Hasman. 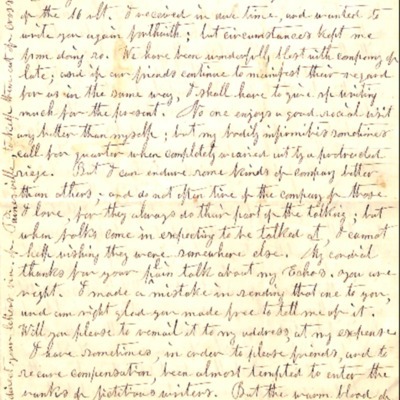 A letter written to Amelia Bloomer from William Hasman. Letter to Amelia Bloomer from T. Park Coni. 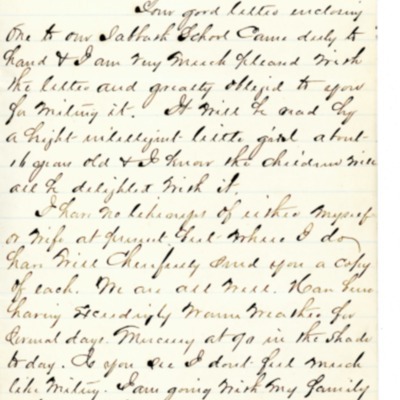 A letter written to Amelia Bloomer from T. Park Coni of Chariton, Iowa. 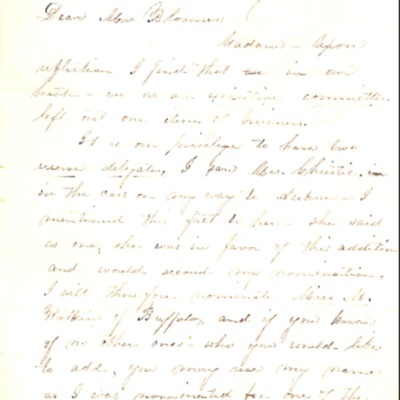 Letter to Amelia Bloomer from V. F. Chamberlain. A letter written to Amelia Bloomer from V. F. Chamberlain for Cincinnati. 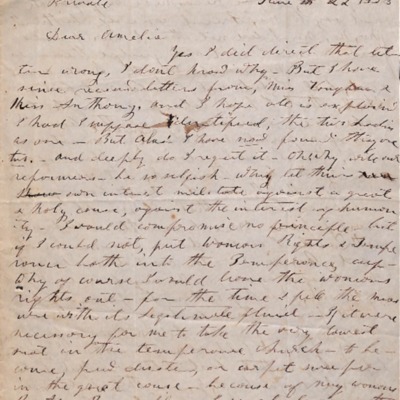 Letter to Amelia Bloomer from Francis Gage. A letter written to Amelia Bloomer from Francis I. Gage. Letter to Amelia Bloomer from J. L. Deforest Sr.
A letter written to Amelia Bloomer from J. L. Deforest Sr. of Magnolia, IA. Letter to Amelia Bloomer from P. L. Alling. A letter written to Amelia Bloomer from P. L. Alling of Rochester. A letter written to Amelia Bloomer from I. S. Chambers of Peekskill, NY. Letter regarding The Lily Newspaper. 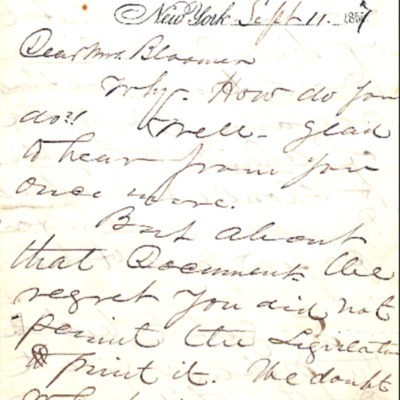 Letter to Amelia Bloomer from F. V. Chamberlain. A letter written to Amelia Bloomer from F. V. Chamberlain of Cincinnati. 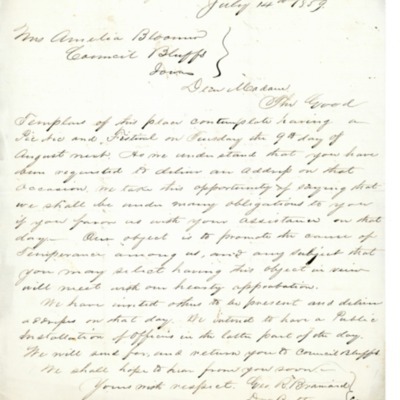 Letter to Amelia Bloomer from H. A. Albin. A letter written to Amelia Bloomer from H. A. Albin of Rochester. Letter to Amelia Bloomer from Clarissa Robie. 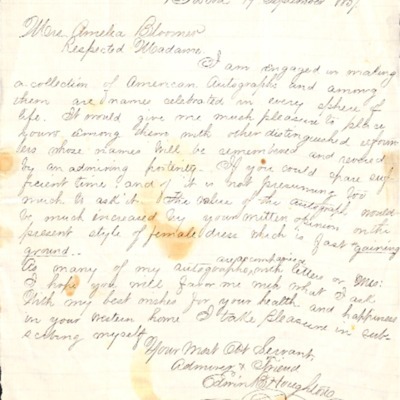 A letter written to Amelia Bloomer from Clarissa W. Robie of Auburn. Letter to Amelia Bloomer from Winterset, Iowa. 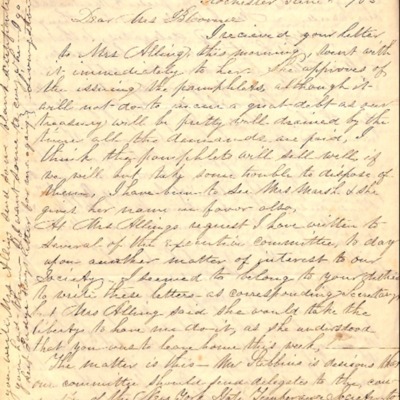 A letter written to Amelia Bloomer, inviting her to speak at an event. Signed by T. D. Guiberson, D. C. McNeil, P.C. Hutchings, and J. A. Pitzer of Winterset Iowa. 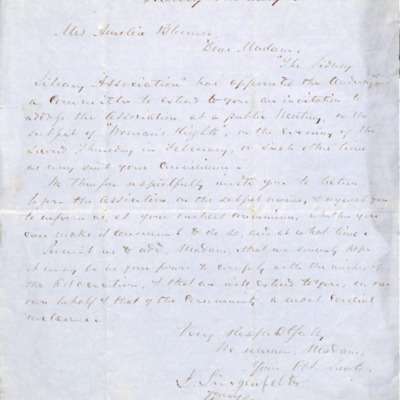 Letter to Amelia Bloomer from M. A. Bronson. 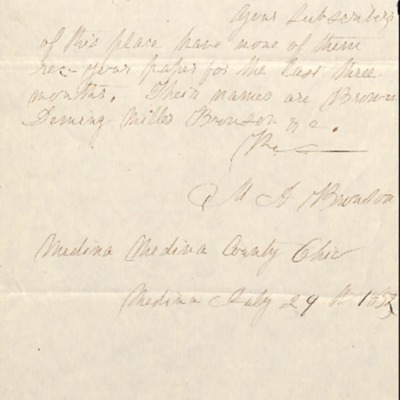 A letter written to Amelia Bloomer from M. A. Bronson of Medina, Ohio. Letter regarding The Lily Newspaper. 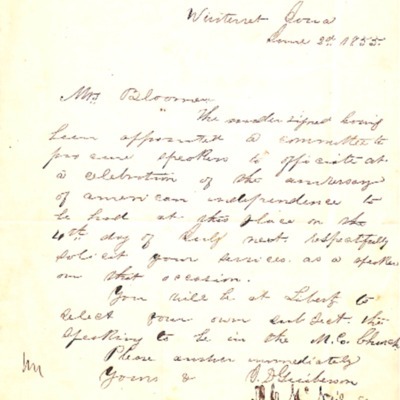 Letter to Amelia Bloomer from Jacob T. Stern. 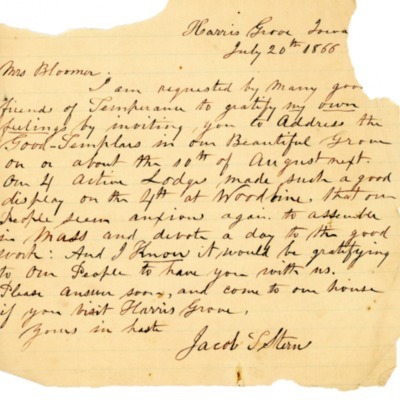 A letter written to Amelia Bloomer from Jacob T. Stern of Harris Grove, Iowa. 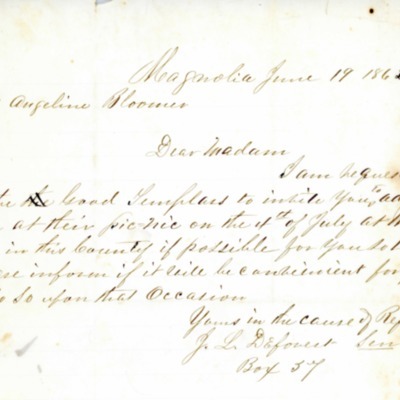 Letter to Amelia Bloomer from Magnolia, Iowa. 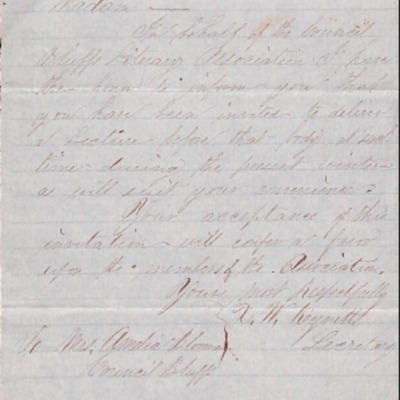 A letter written to Amelia Bloomer from George R. Brainerd, D. W. Butts, and A. L. Henry of Magnolia, Iowa. 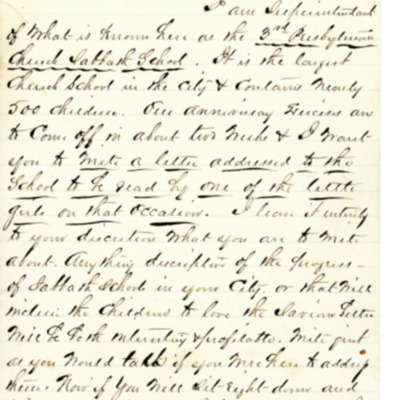 Letter to Amelia Bloomer from Sidney, Iowa. 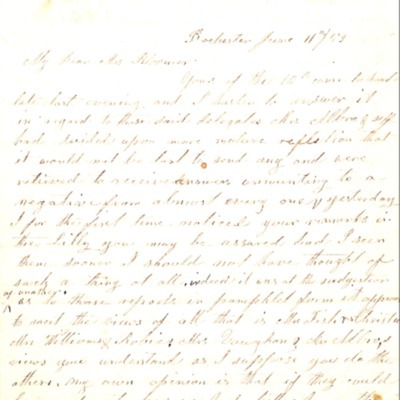 A letter written to Amelia Bloomer from J. Lingenfelter, William Dewey, K. Rictor. Letter to Amelia Bloomer from Harriet N. Torrey. A letter written to Amelia Bloomer from Harriet N. Torrey of Painsville.